CHICAGO, Illinois, December 2, 2010 (ENS) – A federal judge today rejected the request of five Great Lakes states for a preliminary injuction that would force the U.S. Army Corps of Engineers and the Metropolitan Water Reclamation District of Greater Chicago to keep invasive Asian carp out of the Great Lakes. 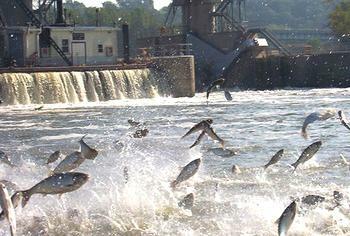 The large fish, introduced in the lower Mississippi River basin years ago to control algae in aquaculture and wastewater treatment ponds, have escaped and spread rapidly northward up the Mississippi River system until tests in December 2009 found Asian carp in Chicago-area waters on the verge of entering Lake Michigan. The economic harm would arise from closing the locks to keep carp out. Seven million tons of cargo pass through the O’Brien Lock each year, as do more than 19,000 recreational boats, many of which are docked on the Calumet River and reach Lake Michigan through the lock. Additional cargo, ferry, and recreation boats use the Chicago Lock. 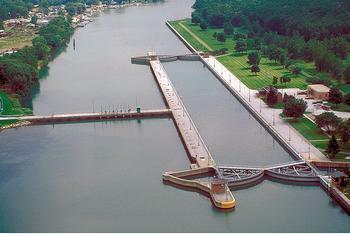 The locks are used by the Coast Guard stations on the Lake Michigan side in responding to safety emergencies on the canal and in patrolling infrastructure facilities in the river system. In June 2010, the first bighead Asian carp was found beyond the existing electric barriers designated to keep Asian carp out of the Great Lakes. The three-foot-long, 20-pound sexually mature male was the first Asian carp found past the last locks protecting the Great Lakes, just six miles from Lake Michigan. In July, the states of Michigan, Wisconsin, Minnesota, Ohio, and Pennsylvania sought a court order requiring the Corps and the District to block the passage of carp into Lake Michigan by closing the man-made canals and natural waterways that serve as both a navigation link between Lake Michigan and the Mississippi River system and an outlet for the stormwater and effluent of the City of Chicago. The states also wanted the court to order the Corps and the District to capture Asian carp, install permanent grates, screens and block nets to keep them out, and kill any carp that might get past the barriers by applying the fish poison rotenone at those areas north of the O’Brien Lock and Dam where the invasive fish are likely to be present. Two species of Asian carp are of concern – silver carp, which can grow to lengths of three feet and weights of 60 pounds, and bighead carp, which can grow to lengths of five feet and weights approaching 100 pounds. Both silver and bighead carp can adapt to a wide range of environmental conditions, reproduce prolifically, and spread rapidly. Both species have become established in rivers in the Mississippi River Basin, including the Illinois River. Asian carp have disrupted and displaced native fish populations in these rivers, harming recreational and commercial fishing. Also, because of their large size and jumping ability, silver carp jump into boats, injuring boaters and causing property damage. Illinois waters were not naturally connected to the Great Lakes. More than 100 years ago, Illinois built an artificial canal system to carry sewage waste away from Chicago. As a result, Illinois waters are now connected to the Great Lakes system, and this man-made connection allows Asian carp-infested water to flow into the Great Lakes. In April, the U.S. Supreme Court declined to hear Michigan Attorney General Mike Cox’s request to permanently close the locks of the Chicago Sanitary and Shipping Canal which connects the Mississippi River to the Great Lakes through the Illinois River. Although Judge Dow has now also ruled against the states, the hunt for a permanent solution to the carp crisis continues. “The real solution is to permanently separate the Mississippi River from Great Lakes,” Muller said. Great Lakes St. Lawrence Cities Initiative is studying ways of separating the two water systems in an 18 month process that began in July. A team led by the Great Lakes Commission and the Great Lakes and St. Lawrence Cities Initiative – organizations representing governors, state officials and mayors – will convene users, stakeholders and technical experts to identify the best economic and environmental solutions for separating the Mississippi River basin from the Great Lakes. In October, the Natural Resources Defense Council issued a technical study of the problem that recommends building two strategically-placed barriers between the Great Lakes and Chicago River. This “could open the door to a revitalized waterway and surrounding communities, while effectively shutting the door on Asian carp,” the NRDC said. Prepared with engineers from Shaw Environmental, with input from city, state, and federal agency stakeholders, the study recommends that barriers be placed at the Racine Pumping station on Bubbly Creek near the Bridgeport neighborhood and at the Calumet Wastewater Treatment Facility on the Cal-Sag Channel on the city’s far southeast side.